Postcard found in a Duval Family photo album. Last week I watched the Discovery Channel mini-series Klondike. My mind has not been able to stop ever since. 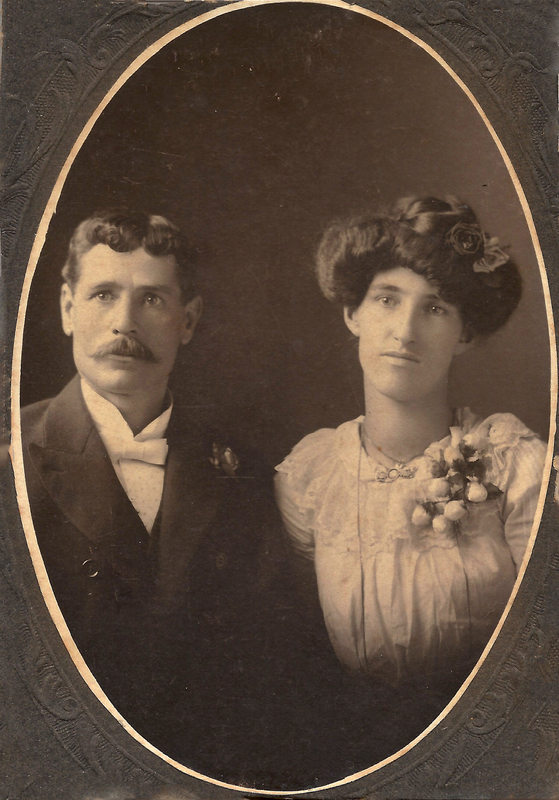 They are my 2nd great grandparents Francis Cyprien Duval & Alice Hyde. They got married in Dawson, Alaska on 12 November 1897. 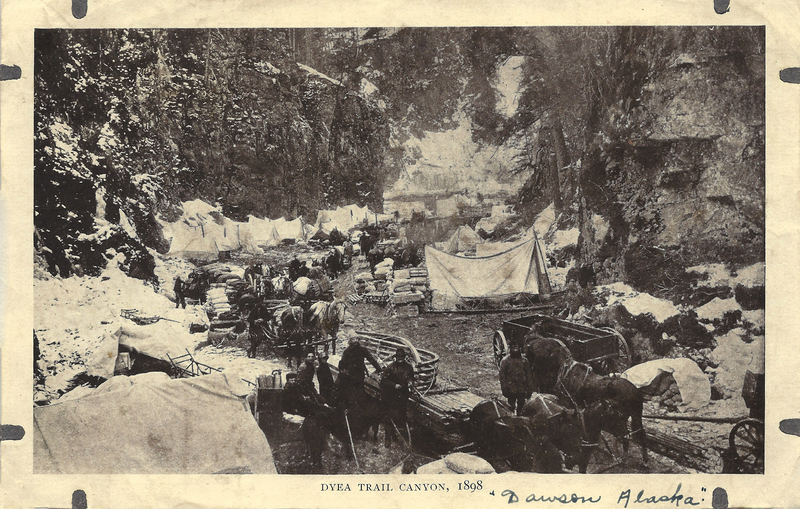 The gold rush in Dawson started in July of 1897 after gold was discovered in 1896. They were totally there for the gold rush. This was not completely new information. I knew when and where they got married. I have done some basic research on Dawson. I knew about the gold rush. I had read about Chilkoot Pass. I had looked at a map. But none of it totally sunk in until I watched Klondike. Why? Well, Frank was an adventurer who moved all around. I wrote about him here. And Alice was the daughter of an adventurer who also moved all around with her dad. Alice’s dad had land in a few different places in Alaska over the years. When I looked at the wedding date and place and read about the gold rush I just passed it off as a coincidence. They happened to live in Dawson at the same time as the gold rush. Just one more place they lived in Alaska. No big deal. Where was my curiosity that day? Gold mining is a multi-generational thing in this family. I have a glass case pendant that holds gold flakes my great grandfather, Frank & Alice’s son, mined. His son still owns gold mines. How did I overlook the fact that they were in Dawson FOR the gold rush?! Who knows? But, after watching Klondike and seeing the landscape, the remoteness, the lawlessness, the crazy pass they had to take to get there I now have a million questions buzzing around in my mind preventing me from getting proper sleep. What was a 17 year old girl doing in Dawson? Did she go with her dad? She must have been very strong mentally and physically to make the journey there and survive the conditions. Did Frank & Alice meet in Dawson or before arriving? Oh and when did they both get there? Were there other family members there? Who did they each travel and live with? Dawson does not seem like the kind of place you to go to alone. It seems you need at least one partner to survive. Did they mine? Were they successful? How long did they stay? Did they meet Jack London? They were there at the same time. When they left, where did they go? They came back to Alaska over and over again. I wonder if they loved it, or just couldn’t quite escape it. I owe my existence, in part, to the Dawson gold rush. I wonder how many marriages came out of that 3 year event in history. How many Dawson gold rush babies are there in the world? I have several photos from the family album that suddenly fill me with curiosity. Most of my questions will not be satisfied with research. But the ones that can be, are now on my list of things to do. I just might be starting a new genealogical obsession. Alaska – I’m coming for you. Watch out! Any fellow gold rush descendants out there? What resources do you love? Previous postFrom the Beginning: What is a source? Love the enthusiasm and excitement that comes through this post. Gave me a ‘rush’ just reading it! Great read from Amberly, the genealogy girl. LOVE her excitement and enthusiasm in this post. Wow, this gave me the shivers. And I didn’t even mean it as a pun! Really really cool stuff!!! That is bringing your family history alive. Thank you! It was pretty exciting to put it all together and feel like I understood their experiences a little better. Wow, your 2nd great grandparents must have led really interesting lives. I haven’t seen the Klondike mini-series, but Alaska had to have been an amazing adventure.